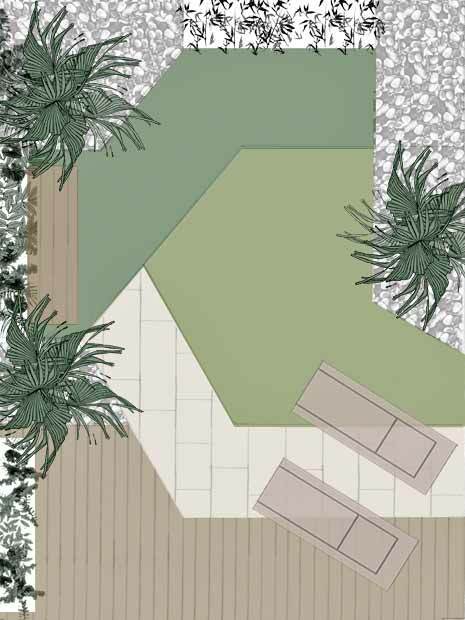 A detailed garden design process sustains an inspiring master plan, when both garden designer and client are on the same wavelength. This clear-cut, straightforward mentality, followed by highly skilled, proactive landscape construction, generates complete outdoor spaces. At times, site constraints redefine a project, when build limitations affect intended design nuances, and new tweaks enhance the result. 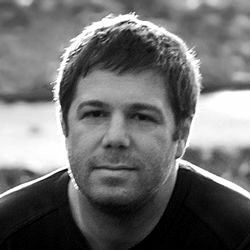 Planting design evolves over time; it's a personal journey, shaped by environmental factors – syncing genius loci with clients' maintenance. 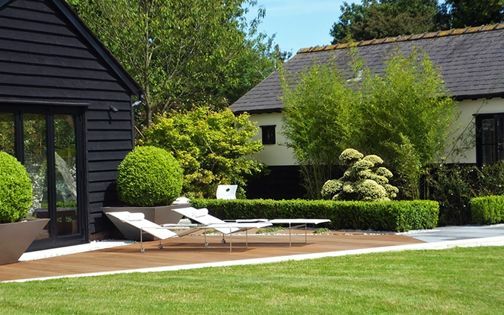 Our outdoor philosophy is as clear as the clean lines we value in the holistic practice of contemporary garden design & build, where each project objective is thoroughly brainstormed to form a cohesive vision and achieve effective, memorable schemes. Still, garden designers are only as good as their landscape builders, and a garden only remains vigorous while maintained consistently. 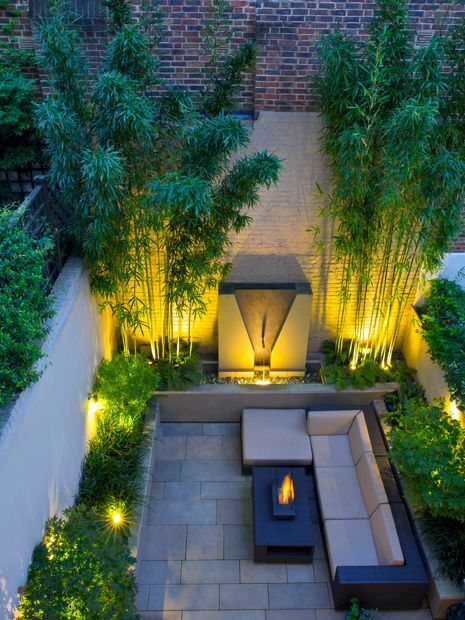 When clients settle into well-constructed outdoor spaces, and savour every vista and design detail, our goal is accomplished – within a definitive garden design process! 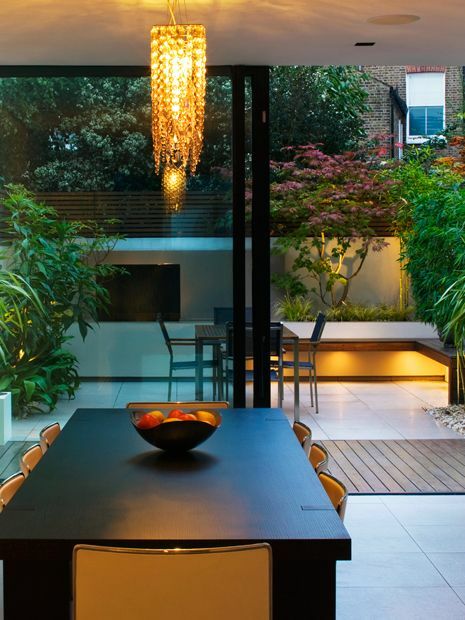 Following the extensive renovation of this Fulham home, its courtyard garden regained valuable essence, masterminded by an inspirational architectural team. The patio tiles selected by the architect were fully integrated throughout four distinct outdoor spaces, while a hardwood deck defines dynamic transition between the kitchen and courtyard, enhancing depth, and leading the eye towards a focal point waterfall. 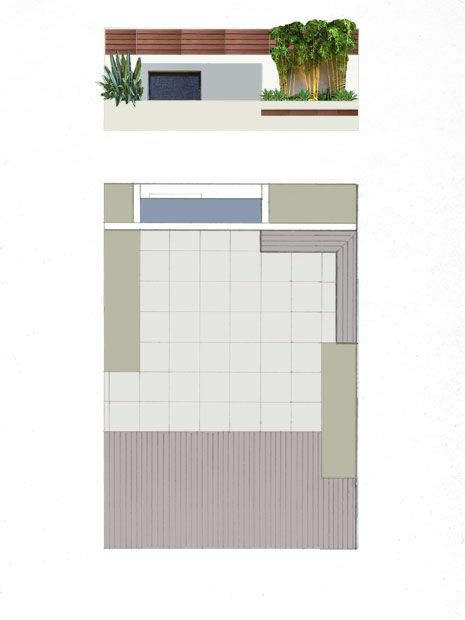 We often tweak design blueprints during construction, yet this plan was landscaped to its original layout, where the result of a cohesive client-designer exchange of modern courtyard garden ideas exceeded our own expectations when we returned for a book photo shoot. 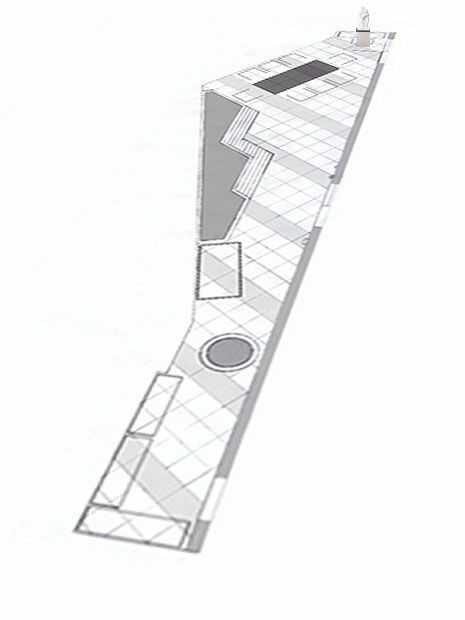 Developers' construction of new urban rooftops, within London penthouse apartments, often lacks landscaping imagination. Here, at Kings Chelsea, we reutilised existing plain slabs by reorientating the layout at an angle, while replacing every fourth line with a lilac band of sandstone. 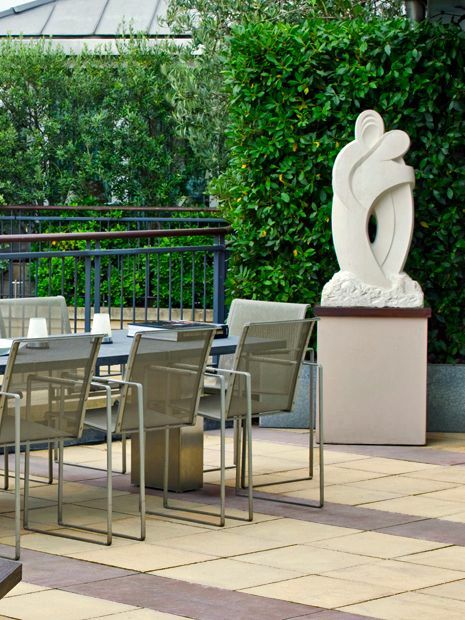 The renewed roof garden regained expansiveness, where a dining table fits snugly along this grid, augmenting a pristine series of clean details. 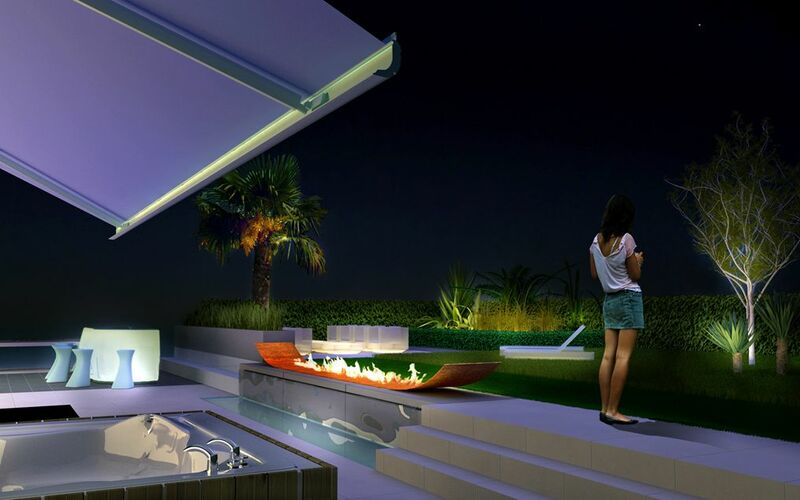 Often, when our clients relocate into a brand-new apartment, this sensible approach provides a long-term solution by sustaining long-lasting, architectural indoor-outdoor compatibility. 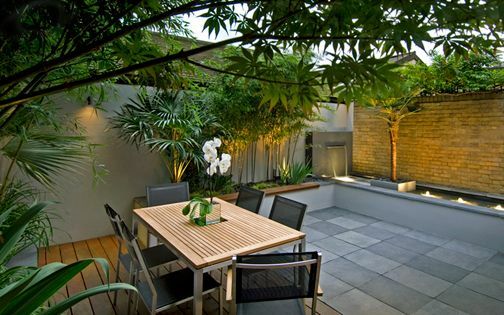 This intimate, secluded rooftop garden forms a distinct focal point, perched atop a private drive in North London. 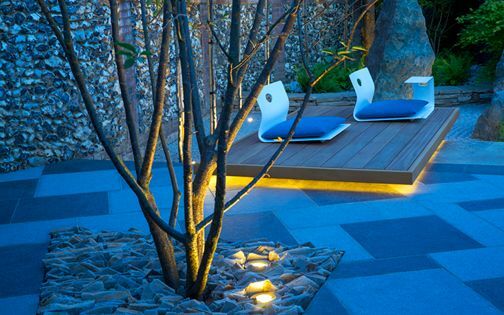 The outdoor space presents a warm entrance ambience, expressed with minimalist lines, while providing a diverse hub for wildlife. We developed a new tree planter detail by folding its top flange inwards at an angle to mimic the perimeter walls' brick element, and plant a Maple specimen below the edge. 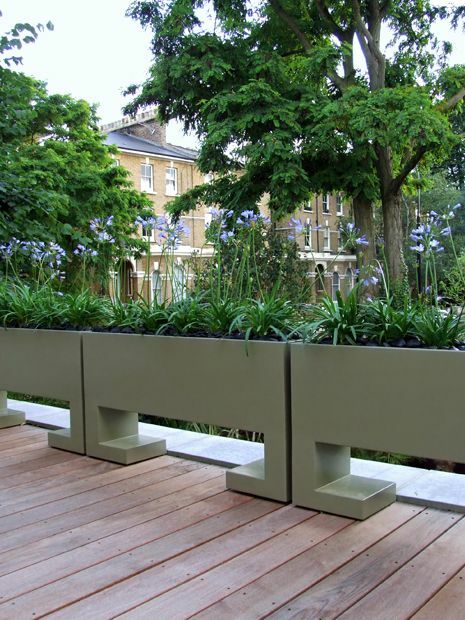 The square planter appears effortlessly balanced, designed wider than its height, where a neutral colour palette across the roof garden is in tune with surrounding woodland. The planter's hue and Paperbark maple tree trunks complement a natural planting scheme, amid an architectural, contemporary landscape design. 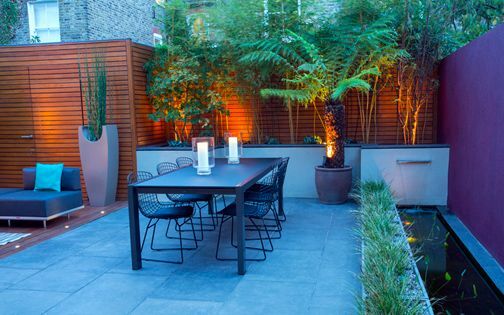 We design sculptural signature pieces in every project, deriving inspiration from our clients' homes, lifestyles or art collections, and in this North London garden, a miniature Agapanthus hedge frames the surrounding urban treescape daintily. 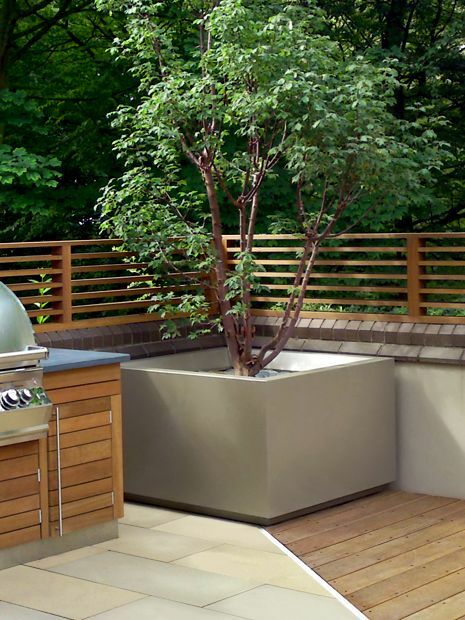 We continually research advanced powder coating techniques to enhance foliage reflections, and accentuate architectural shadows across clear planter surfaces. 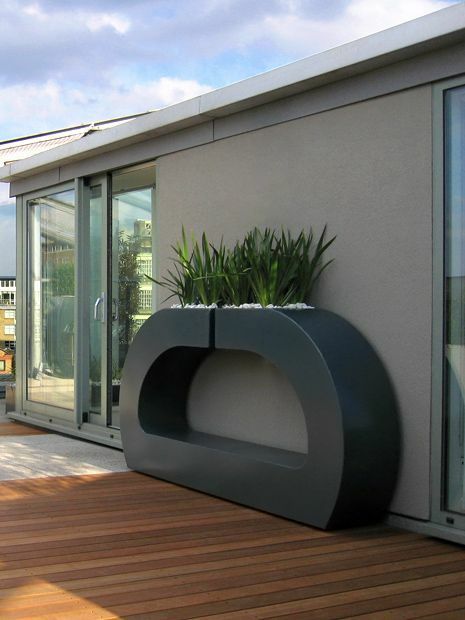 Many of our cutting-edge containers feature apertures or cavities, as further daylight invigorates urban roof terrace designs by articulating contemporary dynamics, while preserving remarkable vistas. 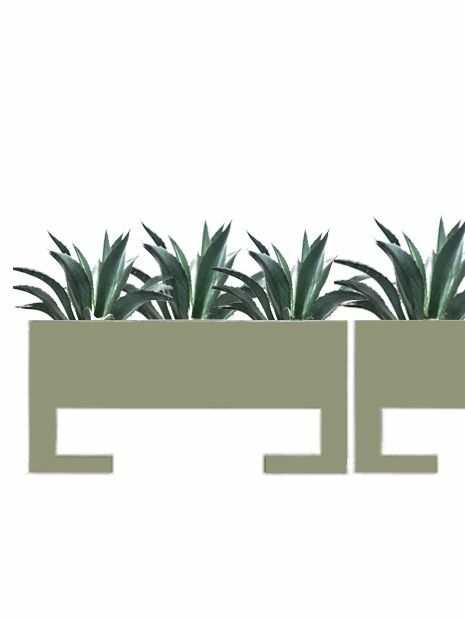 Working primarily for private clients, this distinctive approach forms unique settings, tailored to each site – defining our brainchild of outdoor planters, troughs and containers in modern garden design projects. 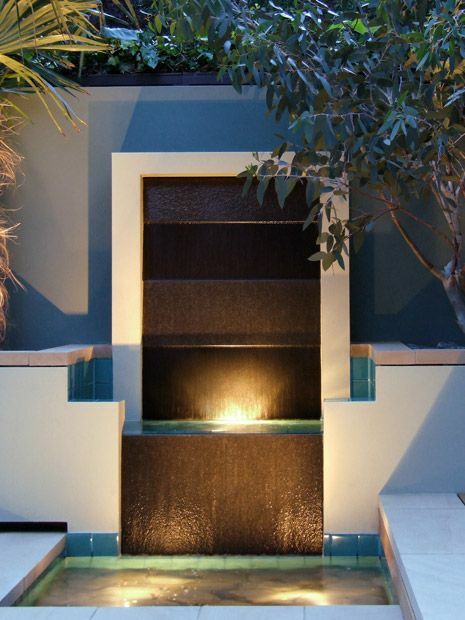 This complex waterfall took a while to develop, yet once its layout was rationalised, a refined detail design process enabled a smooth installation. As with many water features, the uniformity of flowing water across varying granite finishes was tricky to accomplish, where slightly tilting the stones assured a dynamically elegant flow. For this unique waterfall to succeed both visually and technically, an integral background and suitable foliage were essential. 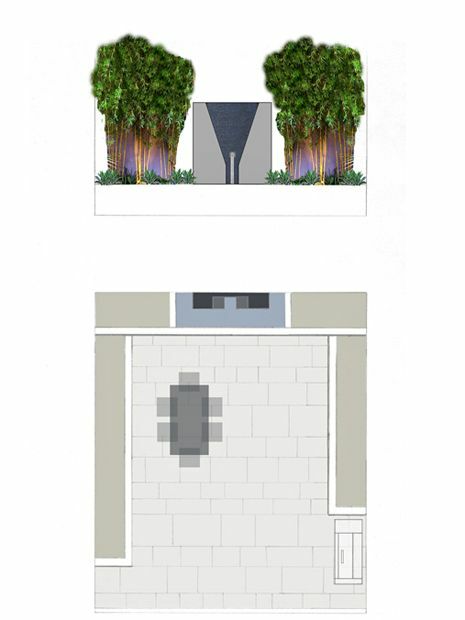 A rendered wall forms a solid backdrop, while sculptural Eucalyptus and Chusan palm trees enhance balance with captivating silhouettes, textures and outdoor lighting which soften the structure. For our client, passionate about all things aquatic, the sense of flowing water fulfilled an ultimate vision – realised in its minutiae across a fluid spectrum! 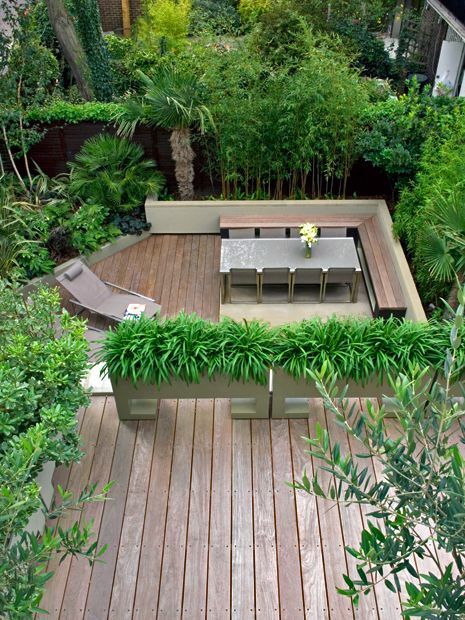 In this comprehensive home refurbishment project, we modified the garden's intended decking orientation, building it inline with the roof terrace's layout. An expansive vista from the master bedroom unveils the fluidity of this modification, where the subtlety of wood details portrays a cohesive design continuum. 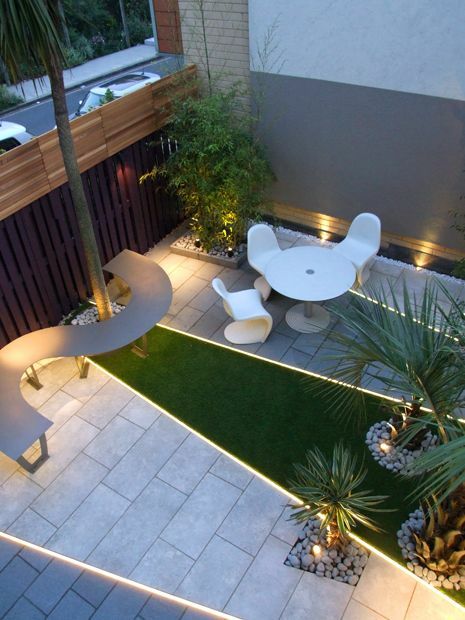 Such on-site tweaks enhance an outdoor space beyond the initial vision, when a versatile team of garden designers liaises closely with supportive and inspiring clients. 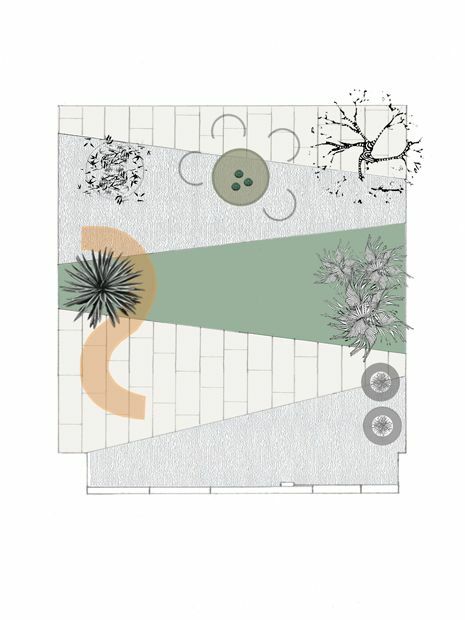 This hands-on methodology forms a pivotal element of our continual intimate garden design dialogue within diverse residential settings. 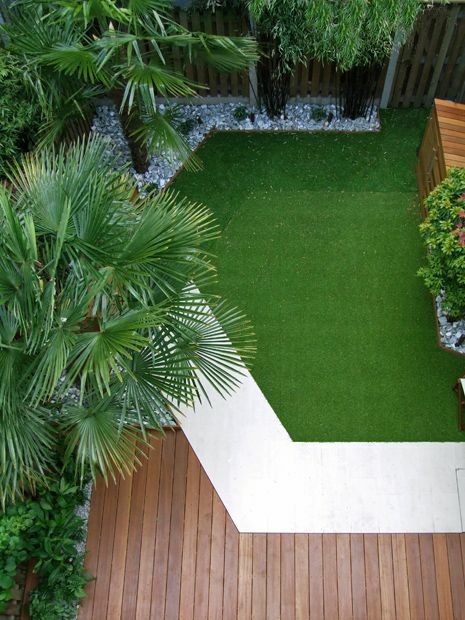 In this Highbury garden, we retained two mature Chusan palm trees which provide an established complete structure. A duo of artificial grasses, varying in both colour and height, defines an invigorating low upkeep soft play area for two young boys. 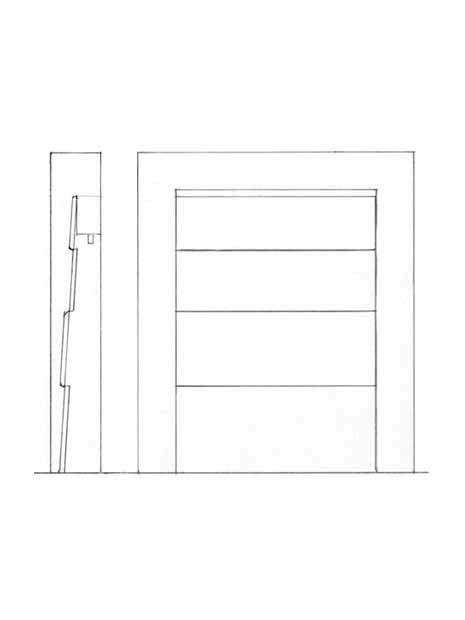 We built the design to its finite detail, bar an omission of a third Palm on the right as specified in the original master plan. Instead, we planted an evergreen Wheel tree, Trochodendron aralioides, to camouflage a built-in storage unit. These last-minute, on-site modifications added further substance, as hardwood is repeated across the entire hard landscaping with greater foliage variety – in a timely tweaking of the family tree! 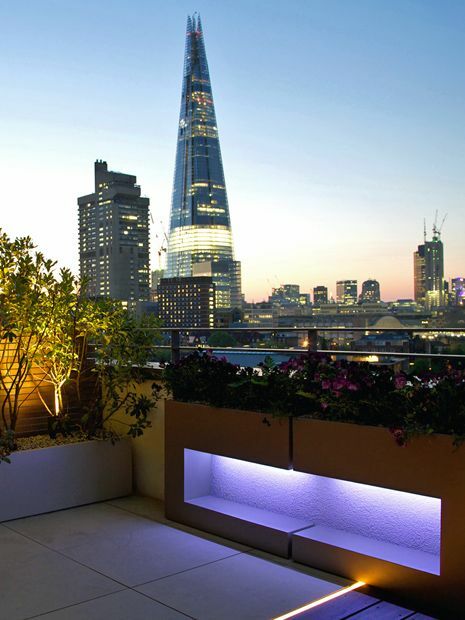 We designed this city terrace in Southwark for a couple, where we included three bespoke pairs of planters along the Shard's up-close panorama. To establish flow into the surrounding urban lightscape, we integrated innovative rooftop lighting within the custom planters and surfaces. 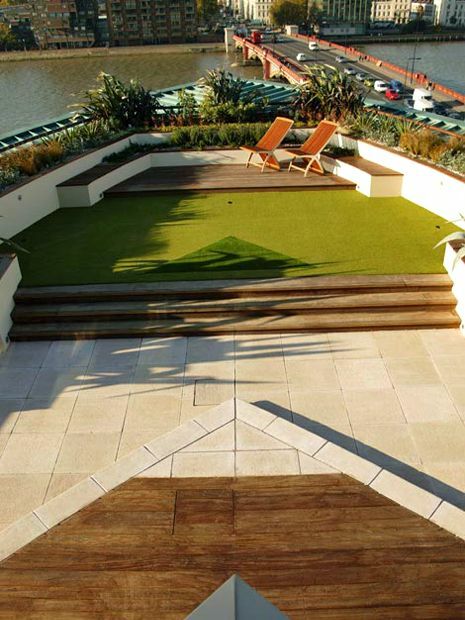 We inherently construct perfectly levelled decks, and here, a streamlined hardwood platform creates a seamless canvas augmented by natural buff sandstone and energising illumination. Each structure elevated from the deck area presents a parallel line, enhancing visual perception fluidly, when horizontal surfaces are gauged towards the terrace's city landscape. Robust Mediterranean flora thrives in the 's blustery conditions, while low planting along the Shard-facing perimeter is refreshed annually. To preserve the neighbours' vista of Canary Wharf, we tapered a Cedar screen to maximise panoramic clarity while maintaining privacy. 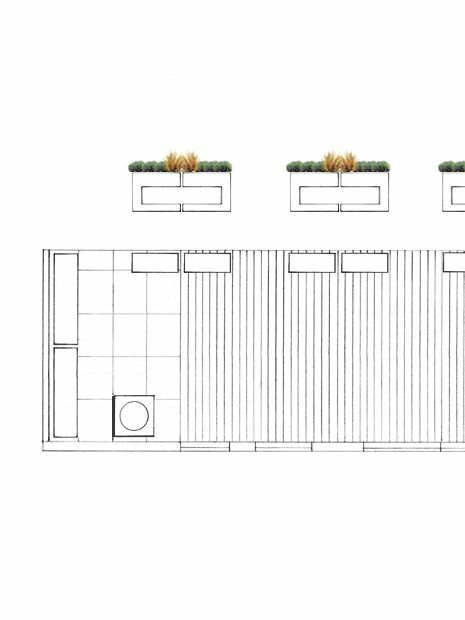 Many penthouse garden layouts focus on the play of light, where we distinctively design site-specific, fitted aperture planters to display along walls and roof terrace glass balustrades, preserving continuous views to water, the skyline, or iconic London landmarks. This 2-metre sinuous planter defines balanced scale with low foliage, while native Irises provide contrast to an architectural design. 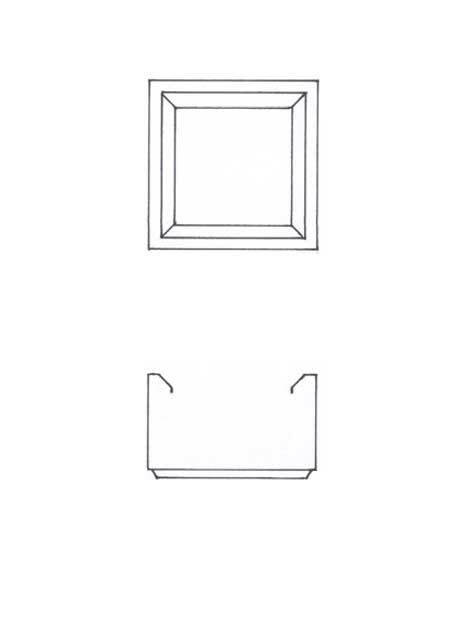 Our metal fabricator produced an accurate framework, transforming a small-scale design drawing into sizeable contours. 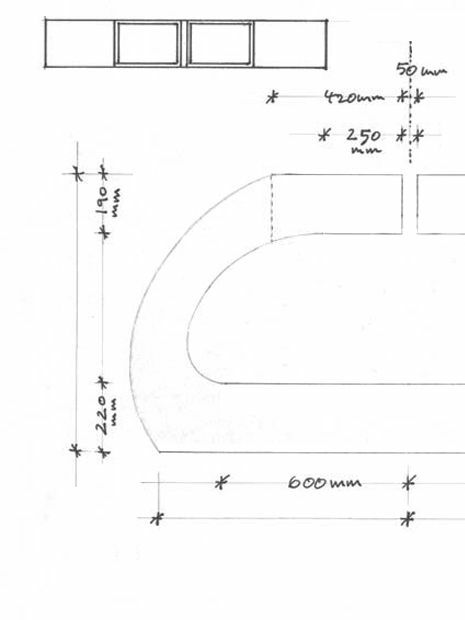 At times, we redraw original outlines directly onto steel sheeting to ensure intricate design nuances are authentically and integrally maintained as highly bespoke elements. With a colossal 220-square-metre canvas on the seventh floor at St George Wharf, the entire design process had to fuse perfectly within its construction network and site preparation. 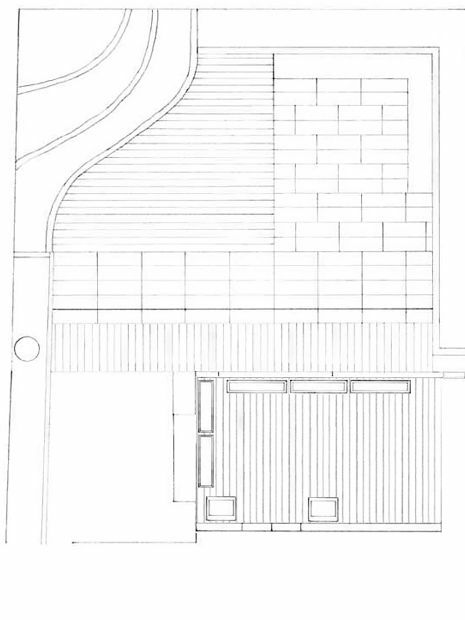 The client steered the project from the outset, determined to overcome a myriad of unusual site constraints. Both the cinematic Central London setting and our client provided inspiration during three months of building work in heat and wind. 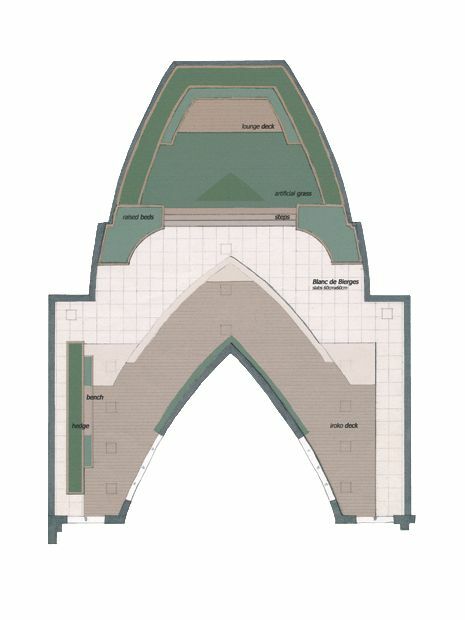 Once the master plan was refined, we devised a safe terrace design & build approach, discussing methods to structurally secure decking to minimise movement, weight calculations, a water supply, logistics and access to a dozen abseiling anchor points. 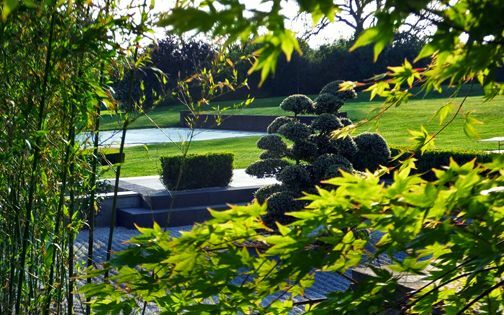 Constructing a sublime garden design with average building skills will invariably result in a setback, while the development of a lacklustre landscape design, no matter how competent the contractor may be, will merely produce an ordinary garden. Selecting suitable specialists for specific tasks proves the most efficient way forwards, since an expert within a multidisciplinary team produces the finest results, when inventive, dedicated project management steers a scheme to success. 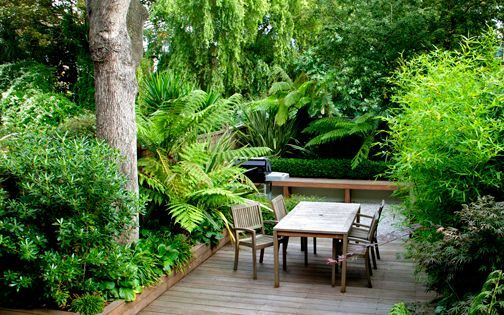 While the mission can be mind-boggling, and the vision is certainly vital, an inspiring garden design process is everything!